A divining tool for journeys through the restless territories and blurred boundaries of art in the social or public realm. Developed for a commission responding to a summit exploring contemporary art practice in rural or 'inbetween' areas, PRESENCE is a set of cards intended to be used open up and explore a project or practice, to be an informal companion on creative journeys. The cards are navigational aids to help understand where we are and where we have been, as well as where we might be going. They can help articulate the aims, methods and values of a project or practice – from the interior, the exterior and the place where it sits. 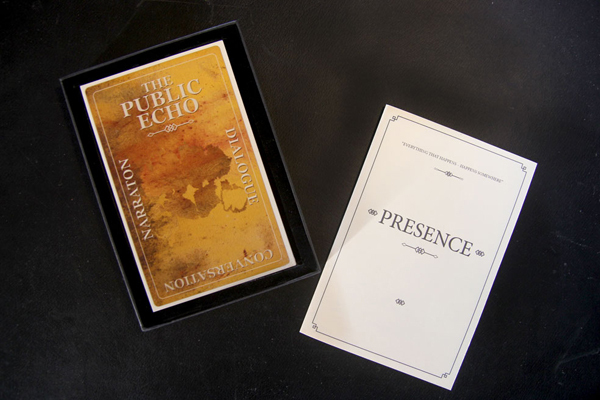 PRESENCE is intended to offer a flexible resource that can be used with all participants, from initial creative meetings, to an evaluation process that might be ongoing or taking place at the end of a project.